Faster Than Light (FTL) is a new space simulation game featuring real time roguelike gameplay. In the game you fight random enemies in random areas in space. The battle system is very innovative. Your ship is divided into many rooms. When an enemy hits, you get some overall damage plus your rooms may catch fire or your life support system may get destroyed. You have to quickly direct your crew to frantically put out these fires and fix other issues with your ship. This is what I have understood so far by watching the video. Though the game looks a bit difficult, it also seems to be quite fun. Roguelikes are not meant to be easy and all the fun lies in their complexity and yes this game too have perma-death. Wish I had access to early game build. 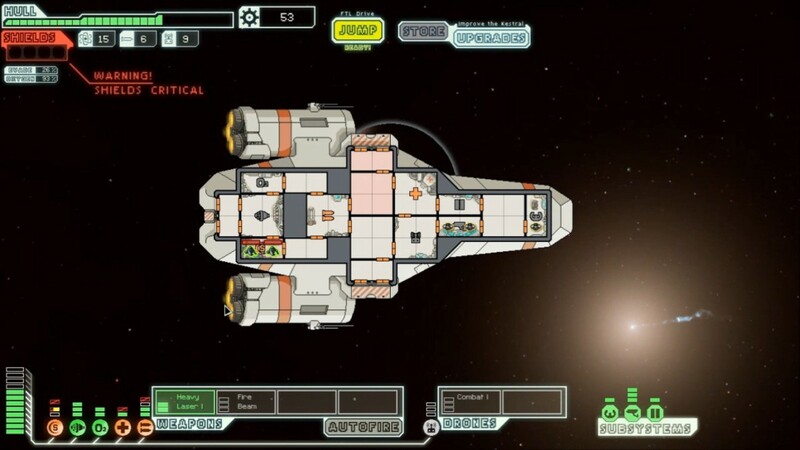 FTL is currently pre-Alpha, and is planned for a Windows, Mac and Linux release in mid-2012. The game is IGF 2011 China finalist and currently only judges have access to game build. So we will have to wait. PC Gamer had the opportunity to go hands on with the game. Read their article if you want to know more about the game.